Your heart races or you’ve got a knot in your stomach. Or your mind gets clogged with worry. You feel nervous, powerless and afraid. These are common symptoms of anxiety. Should you take medications for this problem? There are many potential causes of anxiety such as traumatic life events, health problems or economic hardship. Chronic stress can also lead to anxiety. Many times, however, the cause might not be so clear. Mainstream healthcare often overlooks potential spiritual causes of anxiety. There’s a whole host of treatment options available including psychotherapy, relaxation techniques and alternative or herbal remedies. Medications are also commonly used – but should you resort to pills or not? Billions of dollars are spent every year for the treatment of anxiety, and a large portion of this goes towards medications. Many studies support the use of these drugs. The problem occurs when the medications are used by doctors as a band-aid without addressing the source of your worry. 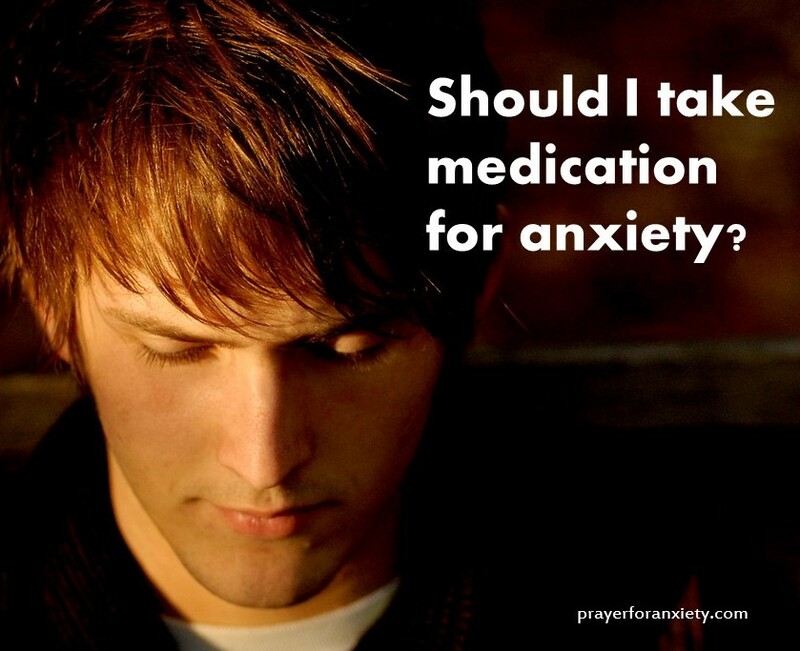 Frequently anti-anxiety meds (or anxiolytics) are prescribed without a solid diagnosis. Or there is no accompanying counseling to help you understand your fears. Another confusing factor is that it might not be the medication that helps you at all, but a placebo effect instead. Simply going to see a doctor can bring you relief, and sometimes just taking a sugar pill makes you feel better. Unfortunately, in our busy world, patients and doctors rush to find a convenient solution. The huge profits made from the sale of anxiolytics adds even more pressure to prescribe. First of all it’s important to understand that anxiety is not “all in your head.” Mental health issues are serious and real. If your worry is excessive you should seek help, but choose wisely. Make sure you team up with someone who is a good listener that doesn’t just prescribe or adjust meds. In some cases, after careful consideration, anxiolytics might be indicated – but they should not be thought of as a cure. If you don’t feel that your current care provider is willing to work with you then look for another practitioner. Also, your church should have resources to help you even if it’s just someone to talk to. The most important question might not be whether or not to take drugs, but instead, where are you putting your faith? If you rely on pills alone you could delay a deeper, more important healing process. This affects how you react to the world around you. While medication might relieve some of your symptoms, it might also delay emotional growth. Sometimes this means you can never get off the drug. These larger issues must be addressed for you to be healthy and strong. It could also mean that you can be drug free. One mistake Christians often make is to rely on prayer alone. While it might be the cornerstone of how we face our fears, prayer should never be used as a form of isolation. We need to talk, share, cry and be hugged once in a while too. But there’s no question about the power of prayer to free you and heal you. When you pray, God often reveals things to you that you might never discover through psychotherapy alone. He can show you aspects about your character that might be hidden. For example, you might have been hurt by a person or situation in the past. Now you associate other uncertainties with a bad past experience, even if they are not really related. Or maybe you have an issue with vanity or pride which manifests itself as fear. These complex emotions can sometimes only be untangled in God’s presence. Jesus repeated over and over, “Fear not!” He was 100% human so he knew all about fear. But he also knew the best antidote to any fear was faith. Even though it’s important to get professional help for severe anxiety problems, don’t rely on worldly solutions alone. If you look for easy answers, you’ll end up disappointed. Anxiety problems take time to resolve. And you always have a choice. You can spend your time paralyzed with worry, running around seeing doctors or in the presence of a God that forgives you and loves you just as you are. Jesus Christ is the Great Physician. Go to him frequently. It takes an effort, but the rewards will go far beyond anything you can imagine. I was diagnosed with the disease of anxiety and depression over 30 years ago. I would be remiss if I did not say this disease has been the challenge of a lifetime. I have never asked God, “Why me?”, it never occurred to me to ask such a thing. There have been times when I have walked hand in hand with the Lord and felt His comfort and presence in my battle. There have been other times when I have wondered if God had forgotten me and wondered what I had done in my life for this “hell” to be visited upon me. Still, I prayed and hoped and trusted in my Savior and He has been good and merciful. Eight years ago, He led me to a Catholic Christian psychiatrist who has brought my life back into focus with his sound therapy, our shared spirituality and a regimen of carefully ordered medication. Yes, God has saved me and allowed me to find joy again. I know if I don’t take my medicine, my brain will not perform as it should, I accept that fully and know it is a part of God’s plan for me. I am with Him in prayer everyday and feel His courage and comfort with me at all times. Before I was shown the way to my caring doctor, there were so many people who told me that my disease would go away if I just prayed hard enough or told me I suffered because my faith was weak. I never responded to those accusations, it was all I could do to exit their presence immediately before I burst into tears and hated myself because I thought they must be right. I would ask those of you who believe that medication is not God’s way and that faith and prayer can erase the disease from your life to re-consider your thoughts. I take my medication the same way others take medication for any chronic disease. Would we ever tell a person who suffered from diabetes to pray their illness away? Absolutely not! I pray for all of you who suffer from anxiety and depression and ask the Lord to be kind and merciful and comforting and your source of light as you see your way through the darkness. Thank you for your testimony! Your words ring with truth and hope. Let us pray that others can find the caring guidance and healing that you found. God bless you! Thank you so much for your sound guidance & prayers, based firmly on God’s Word! Praise be to You dear Father God for Your unconditional love, and total healing as we put our hope & trust in You! Thank you Ralph for your kind words. May the Lord bless, guide and protect you! Thank you Louisely… and God bless you! Agreed. A wise and loyal spiritual guide is a great help. Bless you! Thank you Melissa… God bless you sister!